Whenever I grocery shop with Johnny it reminds me of shopping with a kid. He sees things on end caps or is reminded of foods he used to love and gets all excited. It's always really random things too. Take the last grocery trip we went on together, Johnny got really excited about a bag of frozen cherries he saw while I was grabbing fruit for my smoothies. "I love cherries!" he exclaimed and asked if there was anything I could do with them. I shrugged and threw them in the cart, thinking "sure I'll come up with some quick dessert." Tonight was a pretty lax night in the kitchen for me. I was just reheating some slow cooker split pea soup, so I decided I'd make a dessert (if you could even call it that). Johnny and I are huge fans of fruit in their natural state, so this is not a gooey, sickening sweet dessert. This is more just a nice summer evening end of dinner treat. Dump the bag of cherries into a baking dish. Sprinkle the corn starch over them and roll to coat them. Sprinkle the oats and brown sugar evenly over the cherries and add a dash of salt. Bake in a 350° oven for about 30 minutes until warmed and bubbly. Run under the broiler for a couple minutes to crisp up the top. Serve warm. Yields 4-6 servings. Yum, this hit the spot! Delicious, natural tasting cherries with just a hint of a crunch and extra sweetness in a bite here or there. 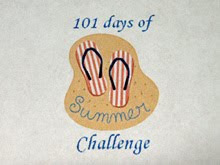 I keep forgetting to blog about this, but I joined Biz's 101 days of Summer challenge! My goal is to move more to tone up and lose some inches! I've lead a pretty stagnant life in the last year and I really want to change that. There are 50 participants including my mom and my cousin, so I have a lot of motivation! Each Sunday the group page is updated with our progress, so make sure to click the button in my sidebar if you want to keep up with us. Let me know if you joined the challenge and what your goals are! I'll help cheer you on and we can be healthy together this summer! Also, please feel free to e-mail me for support, leave comments, and ask how I'm doing with my goal. I can use the constant reminders and motivation and will gladly return the favor for you! That does look delicious! Makes me love it even more that it's simple too! And WTG on the summer challenge with Biz. I'm so excited about how many people have joined and look forward to everyone achieving their goals! I just did 17 minutes of some dance cardio video. It was fun but I had to stop it b/c I thought I was going to die. haha Maybe this week I can make the full 36 minutes! I joined the challenge! I'm hoping it will keep me motivated, and on track. I need the moral support too, so let's do this together! I just bought a bag of cherries last night - that looks delicious! wow, I love that you just came up with this idea from what he randomly threw in the cart! Looks great! Ooooh! Gosh, how lucky can Johnny be?! The dessert looks awesome! That cherry dessert looks so good - Tony loves the yellow cherries, but they are so expensive - like $7 a pound! Hi Christina!! Oh man that dessert looks delicious. For some reason, I've had a really really difficult (read: impossible) time finding frozen cherries in Chicago!!! I've searched everywhere but nope, haven't found them yet. Jonny is lucky man.